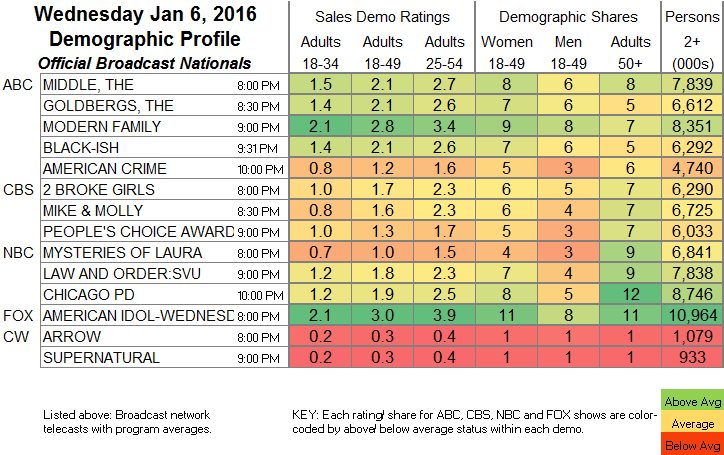 NETWORK UPDATE: MODERN FAMILY gained 0.1 in final numbers, while THE MYSTERIES OF LAURA lost the same. CABLE HIGHLIGHTS: We have another instance today of either the network or Nielsen mistakenly listing an original show as a rerun, which resulted in it being omitted from the chart. This time it’s FX and AMERICAN HORROR STORY: HOTEL, which was actually the #3 original of the night at 0.85 (down 0.09 from its last airing on December 16), with 1.84M total viewers. The night’s winner was Discovery, with 1.17 for ALASKAN BUSH PEOPLE (up 0.04 from last week), followed by a lead-out special at 0.88. ESPN’s NBA double feature was at 0.60 (Knicks vs. Heat)/0.51 (Grizzlies vs. Thunder). History aired 2 episodes of PAWN STARS at 0.54/0.51. TLC’s MY 600-LB LIFE was at 0.48, with a lead-in special at 0.39, and lead-out SKIN TIGHT at 0.43. 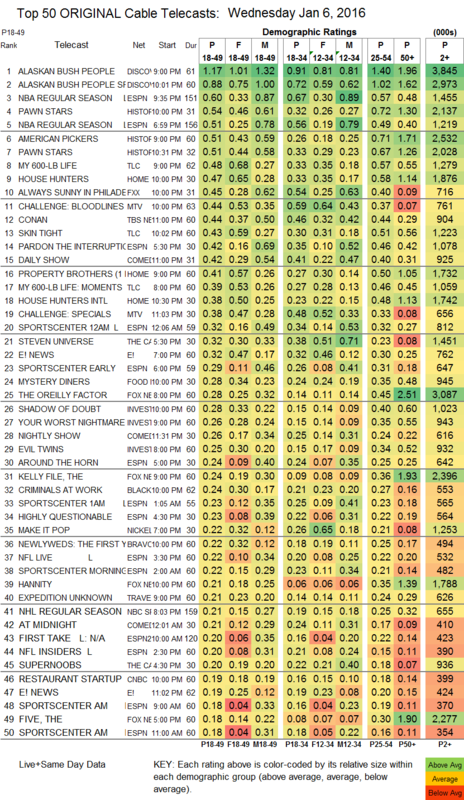 HGTV’s HOUSE HUNTERS ticked down to 0.47, with PROPERTY BROS at 0.41, and HOUSE HUNTERS INTL down a tenth to 0.38. On FXX, the premiere of the final season of IT’S ALWAYS SUNNY IN PHILADELPHIA was at 0.45 (down 0.06 from last January’s premiere), followed by the season premiere of MAN SEEKING WOMAN at 0.17 (down 0.02 from its series premiere). On MTV, THE CHALLENGE was down 0.04 from last week’s 10PM episode to 0.44, and a lead-out special was down 0.08 from last week’s 11PM episode to 0.38. Bravo’s NEWLYWEDS: THE FIRST YEAR was at 0.22. MTV2’s NICK CANNON WILDNOUT dropped 0.09 to 0.16, and lead-out JOKING OFF fell 0.07 to 0.12. Tru’s just-renewed BILLY ON THE STREET was at 0.15.